Supported by "13th Five-Year" National Key Research and Development Project (2016YFC1300700) and National Natural Science Foundation of China (81571118, 81701775). Abstract: Objective To evaluate the safety and efficacy of Tubridge and Pipeline embolization devices in the treatment of complex intracranial aneurysms. Methods The clinical data of 99 patients harboring 101 complex intracranial aneurysms, who underwent embolization device treatment between Aug. 2010 and Dec. 2017 in our department, were retrospectively collected and analyzed. Among them, 91 aneurysms were treated for the first time and 10 were recurrent lesions. The mean maximum diameter of the aneurysms was (19.6±6.6) mm. Ninety-four lesions were located in anterior circulation and 7 in posterior circulation. Sixty-one aneurysms of 61 patients were treated with Tubridge embolization device, and 40 of 38 patients were treated with Pipeline embolization device. Clinical and angiographic follow-up were preformed conventionally. Results A total of 116 embolization devices (74 Tubridge and 42 Pipeline) were delivered and implanted successfully. One patient died of delayed hemorrhage, and 2 patients suffered from ischemic events after operation. Angiographic follow-up data was available in 88 aneurysms. The complete occlusion rates of short-term (0-6 months), mid-term (7-18 months) and long-term (>18 months) were 66.7% (42/63), 73.5% (36/49) and 89.3% (25/28), respectively. The complete occlusion rate of all aneurysms was 72.7% (64/88) at the last imaging follow-up, and there was no significant difference between the Tubridge and Pipeline groups (73.6%[39/53] vs 71.4%[25/35], P>0.05). Conclusion Both Tubridge and Pipeline embolization devices are safe and effective in treatment of complex intracranial aneurysms. However, the complications shall not be ignored after implantation of embolization device. BENDER M T, JIANG B, CAMPOS J K, LIN L M, BEATY N, VO C D, et al. 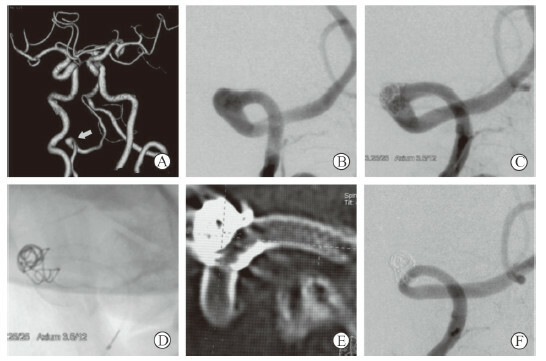 Single-stage flow diversion with adjunctive coiling for cerebral aneurysm:outcomes and technical considerations in 72 cases[J]. J Neurointerv Surg, 2018, 10: 843-850.